Fermi's Large Area Telescope has recently detected two short-duration gamma-ray pulses coming from the Crab Nebula, which was previously believed to emit radiation at very steady rate. The pulses were fueled by the most energetic particles ever traced to a discrete astronomical object. Image courtesy of NASA/ESA. (PhysOrg.com) -- The Crab Nebula, one of our best-known and most stable neighbors in the winter sky, is shocking scientists with a propensity for fireworksgamma-ray flares set off by the most energetic particles ever traced to a specific astronomical object. The discovery, reported today by scientists working with two orbiting telescopes, is leading researchers to rethink their ideas of how cosmic particles are accelerated. "We were dumbfounded," said Roger Blandford, who directs the Kavli Institute for Particle Astrophysics and Cosmology, jointly located at the Department of Energy's SLAC National Accelerator Laboratory and Stanford University. 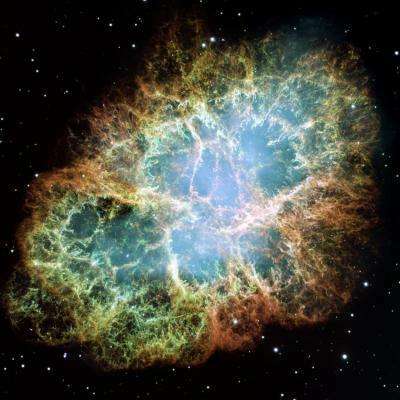 "It's an emblematic object," he said; also known as M1, the Crab Nebula was the first astronomical object catalogued in 1771 by Charles Messier. "It's a big deal historically, and we're making an amazing discovery about it." Blandford was part of a KIPAC team led by scientists Rolf Buehler and Stefan Funk that used observations from the Large Area Telescope, one of two primary instruments aboard NASA's Fermi Gamma-ray Space Telescope, to confirm one flare and discover another. Their report was posted online today in Science Express alongside a report from the Italian orbiting telescope Astro‐rivelatore Gamma a Immagini LEggero, or AGILE, which also detected gamma-ray flares in the Crab Nebula. The Crab Nebula, and the rapidly spinning neutron star that powers it, are the remnants of a supernova explosion documented by Chinese and Middle Eastern astronomers in 1054. After shedding much of its outer gases and dust, the dying star collapsed into a pulsar, a super-dense, rapidly spinning ball of neutrons that emits a pulse of radiation every 33 milliseconds, like clockwork. Though it's only 10 miles across, the amount of energy the pulsar releases is enormous, lighting up the Crab Nebula until it shines 75,000 times more brightly than the sun. Most of this energy is contained in a particle wind of energetic electrons and positrons traveling close to the speed of light. These electrons and positrons interact with magnetic fields and low-energy photons to produce the famous glowing tendrils of dust and gas Messier mistook for a comet over 300 years ago. The particles are even forceful enough to produce the gamma rays the LAT normally observes during its regular surveys of the sky. But those particles did not cause the dramatic flares. Each of the two flares the LAT observed lasted mere days before the Crab Nebula's gamma-ray output returned to more normal levels. According to Funk, the short duration of the flares points to synchrotron radiation, or radiation emitted by electrons accelerating in the magnetic field of the nebula, as the cause. And not just any accelerated electrons: the flares were caused by super-charged electrons of up to 10 peta-electron volts, or 10 trillion electron volts, 1,000 times more energetic than anything the world's most powerful man-made particle accelerator, the Large Hadron Collider in Europe, can produce, and more than 15 orders of magnitude more energetic than photons of visible light. "The strength of the gamma-ray flares shows us they were emitted by the highest-energy particles we can associate with any discrete astrophysical object," Funk said. Not only are the electrons surprisingly energetic, added Buehler, but, "the fact that the intensity is varying so rapidly means the acceleration has to happen extremely fast." This challenges current theories about the way cosmic particles are accelerated, which cannot easily account for the extreme energies of the electrons or the speed with which they're accelerated. The discovery of the Crab Nebula's gamma-ray flares raises one obvious question: how can the nebula do that? Obvious question, but no obvious answers. The KIPAC scientists all agree they need a closer look at higher resolutions and in a variety of wavelengths before they can make any definitive statements. The next time the Crab Nebula flares the Fermi LAT team will not be the only team gathering data, but they'll need all the contributions they can get to decipher the nebula's mysteries. "We thought we knew the essential ingredients of the Crab Nebula," Funk said, "but that's no longer true. It's still surprising us." Of course, you realize this could have insanely profound consequences in how data from other, more distant objects is interpreted. For example, if other distant objects are producing significant amounts of their energies through similar processes, it might mean those objects are orders of magnitude less massive than previously believed based on the power of their radiation. That is to say, the masses may be severe over-estimates based apparant magnitude, due to ignorance of unknown force-particle interactions such as this. Hitting a kink in the magentic field would then produce the (much higher-energy) X-rays. The surprise to scientists seems to be the idea that these high-energy electrons are still there. But we have a very nice cart and horse problem: a strong magnetic field would be needed to trap them, and by looping around the neutron star, the energetic electrons would generate exactly that magnetic field. Make the field strong enough, or the number of electrons trapped large enough, and you get a magnetar. It's not enigmatic in a universe where plasmas are permitted to possess electric fields. As ALWAYS occurs with these "unexplainable" energies witnessed in space, the enigma pertains to conventional gravity-based cosmology -- not its competing plasma-based cosmology (which to the dismay of conventional theorists continues to be a topic of publication by the world's largest scientific institution, IEEE). Until our science journalists and universities re-introduce the Big Bang's "former competitor", and commit themselves to investing equivalent time and effort into refining those models, theorists will feel compelled to glue all observations to the conventional theories, regardless of how obvious the observations support the opposing cosmology. Meanwhile, they've stopped interpreting observations through an electrical cosmic plasma perspective. Students today have no idea that these things can even be explained with plasma cosmology. I'm not entirely sure what you people are talking about. I just want to see a time-lapse of that nebula explosion. Would look pretty. Where in the universe would I need to put the camera, anyone? Let this article be a siren call to all the cranks. Crank away! But PLEASE come up with something new. Stop throwing the same old discredited pet theories out there. If you are really, really tied to something, address its inadequacies. HA: Why can't we detect the ambiplasma? What is the CMB? What can Plasma Cosmology predict that isn't offered by the BB that we can test/observe? Plasma is there, no denying. The question is more the limits of its effect vs. gravity. Obviously there is stuff going on we didn't know about. However, I didn't see any predictions of gamma-ray flares 1000 years after a supernova from any cranks either. "We were dumbfounded," said Roger Blandford, who directs the Kavli Institute for Particle Astrophysics and Cosmology, jointly located at the Department of Energy's SLAC National Accelerator Laboratory and Stanford University. 1." The Sun's origin, composition, and source of energy," 32nd Lunar & Planetary Science Conference, Houston, TX, 12-16 March 2001. It is, of course, neutron repulsion. Neutron repulsion is an empirical fact - recorded in nuclear rest mass data for every nucleus with two or more neutrons. Journal of Fusion Energy 20, 197-201 (2003). I don't claim to support anything conventional or non-conventional, but only the "truth". I have heard some fairly exotic explanations of stellar formation in theories that at least SEEM internally consistent. For example, in a repulsive gravity theory, the theory that gravity is caused by radiation pressure from "everyehwere else," and we experience "attraction" due to the mass shadow of the nearby objet rather than an attractive force or a warping of space-time; in this theory, large objects have most of their mass masked, since after a certain point, making a bigger "shadow" no longer matters. Repulsive gravity theoreis therefore predict that the Sun is actually an ultra-dense object (super-atom or neutron star,) undergoing some sort of fission, rather than a hydrogen/helium based object undergoing fusion. The fact that we see all sorts of materials ejected from the Sun in Solar Wind somewhat supports this. Not saying it's right or I believe it. ; in this theory, large objects have most of their mass masked, since after a certain point, making a bigger "shadow" no longer matters. You do know that gravity follows the inverse square law don't you? Perhaps not. Well it does and that repulsion idea would NOT follow the inverse square law. So it is even sillier than Oliver's neutron repulsion idea with would have larger atoms needing LESS neutrons per proton instead the MORE neutrons per proton that we actually see. Two things a theory should do if it is to replace a prevailing theory. It should fit the present evidence at least as well as the prevailing theory. It SHOULD make predictions that the present theory does not AND be right in those predictions. If it does not do the second BUT succeeds in the first it should at least be simpler to calculate. "super-charged electrons of up to 10 peta-electron volts, or 10 trillion electron volts"
I come here for interesting stories, but I am about fed up with the generally poor editing quality. The differing naming conventions are a constant pain in the neck. So its a mess all around. 10 to the 15 is NOT 10 quadrillion. Its ONE quadrillion or ONE peta volt. No matter how you add it up Physorg has it wrong, PETA is always 10 to the 15 so EITHER trillion is wrong BUT its ONE not TEN. Maybe. SLAC has two different numbers as well. Just use metric nomeclature. peta is always peta, etc. Prof Jocelyn Bell Burnell discovered pulsars in 1967 and is not at all happy with the way Astronomy is going she states "It is getting messier and messier..". [BBC4 2010] The reason? Electricity has been left out of the equations. Hence we still have a theory that states: .." the dying star collapsed into a pulsar, a super-dense, rapidly spinning ball of neutrons that emits a pulse of radiation every 33 milliseconds, like clockwork." In electronics we gave up on motorised flashing lights about a century ago - the Relaxation Oscillator can be knocked up with basic capacitor and non-lin resistor in minutes. Nature provides all the necessary parts in a plasma environment = star/ nebula. You detect plasma via magnetic fields, x-rays, UV, radio waves - it's electicity in space and always has been. I agree Cigarshaped. It is so blatently obvious. It is behaving not sort of like, but actually exactly how a relaxation oscillator would be expected to behave. I even had one astronomer tell me that only a few people can actually grasp the concept of neutron stars, black holes, dark matter, and dark energy. What arrogance! I think what is happening now in Astronomy is like those 12 steps toward death. Anger, denial, etc., etc. Everytime you try to reason with astronomers on this issue, I am almost universally greeted with either one emotion or the other (Anger or denial). I guess I would be embarrassed too if I spent my life telling everyone Santa Claus existed and then everyone found out I was lying (maybe that's why kids end up hating their parents?). Anyway, as long as the astronomers keep giving us valid data, we will interpret the numbers for them since they seem to have a problem seeing the forest for the trees. SockPuppets are talking to themselves again. what is a sock puppet? I can only imagine it is some new concept dreamed up to explain these new mysteries. Maybe we can add "sock puppet" to the list of absurd hypothetical objects (AHOs). So now we have black holes, neutron stars, dark matter, dark energy, and finally, sock puppet. In your world, Ethelred, it makes perfect sense. You might oughta think of a new name though, the old marketing thing ya know. Perhaps "Genie Particle." You and Cigarshaped. New accounts from people that already have accounts and want to pretend that there is more than one or two people pushing this crap. What new mystery. I covered this nonsense with you months ago under your previous name. ou might oughta think of a new name though, the old marketing thing ya know. Unlike you and your fellow Cranks I don't have to change my name to obfuscate reality. I have been using it for nearly a decade online. I have never been to this site, and I don't appreciate being cyberbullied by you. Is is fear you have? By the way, Ethelred, if you try to contact me via email or other method outside this forum, or show up at my house like one guy did, I already had to call the police on a previous person who wanted me burned at the stake so to speak. I will not tolerate being cyberbullied or stalked. and I don't appreciate being cyberbullied by you. Is is fear you have? I didn't bully you. Just pointed out reality. Why would do that? You are a Crank. I have no interest in you except to point out your errors. YOU are a bloody idiot if you are posting your real name on ANY forum. Few do that here and many of them are Cranks pushing idiot theories. Where the hell did I do ANYTHING that remotely hinted at doing that? who wanted me burned at the stake so to speak. Haven't had that. Hung though. Several times. But I have never been so stupid as to let the idiots know where I live. Oh I tell the city, Anaheim but that won't help anyone find me. I will not tolerate being cyberbullied or stalked. I don't tollerate baseless accusations from ANYONE much less a Crank. This post of yours is being reported. I would highly recommend the National Radio Telescope Observatory website to see some incredible photos. In particular, the double radio galaxy NGC 383 and its sister "plasmoids" appear to be either new galaxies being formed (in pairs) by a mammoth power source, or possibly regeneration of galaxies. Google it and then look it up.